On the basis of a review of all literature describing transchondral fractures of the talus, Berndt and Harty developed a classification system for radiographic staging of osteochondral lesions of the talus (OLTs). Their classification system has been the foundation for other systems, yet it remains the most widely used system today (see Staging). Conservative treatment should be attempted first, whenever possible. Surgical treatment depends on a variety of factors, including patient characteristics and lesions (see Treatment). Surgery is contraindicated when the risks outweigh the perceived benefits. For patient education resources, see Ankle Arthroscopy, Understanding X-rays, and Magnetic Resonance Imaging (MRI). Osteochondral lesions of the talus. Modified staging system by Loomer et al. Approximately 60% of the talar surface is covered by articular cartilage. The talus has no muscular or tendinous attachments. Most of its blood supply enters through the neck via the sinus tarsi. The dorsalis pedis artery supplies the head and neck of the talus. The artery of the sinus tarsi is formed from branches of the peroneal and dorsalis pedis arteries. The artery of the tarsal canal branches from the posterior tibial artery. The sinus tarsi artery and the tarsal canal artery join to form an anastomotic sling inferior to the talus, from which branches enter the talar neck. Posttraumatic medial lesions are deeper and cup-shaped. They result from a combination of inversion, plantarflexion, and external rotation forces that cause the posteromedial talar dome to impact the tibial articular surface with a relatively more perpendicular force vector. The results of other studies indicated that the mean cartilage thickness is inversely related to the mean compressive modulus. [7, 8] These findings may lend credence to the clinically observed etiology of OLTs (ie, repetitive overuse syndrome in medial lesions and an acute traumatic event in lateral lesions). Both Konig  and Kappis  believed that lesions due to OCD were the result of ischemic necrosis of the underlying subchondral bone that eventually led to separation of the fragment and its overlying articular cartilage. Nonoperative treatments of OLTs are associated with published success rates of 45-50%. [22, 23] Operative interventions have repeatedly been reported with significantly better success rates. Konig F. Uber freie Korper in den gelenken. Dtsch Z Chir. 1888. 27:90-109. Kappis M. Weitere beitrage zur traumatisch-mechanischen entstehung der "spontanen" knorpela biosungen. Dtsch Z Chir. 1922. 171:13-29. BERNDT AL, HARTY M. Transchondral fractures (osteochondritis dissecans) of the talus. J Bone Joint Surg Am. 1959 Sep. 41-A:988-1020. [Medline]. Sugimoto K, Takakura Y, Tohno Y, Kumai T, Kawate K, Kadono K. Cartilage thickness of the talar dome. Arthroscopy. 2005 Apr. 21 (4):401-4. [Medline]. Bruns J, Rosenbach B, Kahrs J. [Etiopathogenetic aspects of medial osteochondrosis dissecans tali]. Sportverletz Sportschaden. 1992 Jun. 6 (2):43-9. [Medline]. Athanasiou KA, Niederauer GG, Schenck RC Jr. Biomechanical topography of human ankle cartilage. Ann Biomed Eng. 1995 Sep-Oct. 23(5):697-704. [Medline]. Shepherd DE, Seedhom BB. Thickness of human articular cartilage in joints of the lower limb. Ann Rheum Dis. 1999 Jan. 58(1):27-34. [Medline]. Treppo S, Koepp H, Quan EC. Comparison of biomechanical and biochemical properties of cartilage from human knee and ankle pairs. J Orthop Res. 2000 Sep. 18(5):739-48. [Medline]. Christensen JC, Driscoll HL, Tencer AF. 1994 William J. Stickel Gold Award. Contact characteristics of the anklejoint. Part 2. The effects of talar dome cartilage defects. J Am Podiatr Med Assoc. 1994 Nov. 84(11):537-47. [Medline]. Assenmacher JA, Kelikian AS, Gottlob C. Arthroscopically assisted autologous osteochondral transplantation for osteochondral lesions of the talar dome: an MRI and clinical follow-up study. Foot Ankle Int. 2001 Jul. 22(7):544-51. [Medline]. Anderson IF, Crichton KJ, Grattan-Smith T. Osteochondral fractures of the dome of the talus. J Bone Joint Surg Am. 1989 Sep. 71(8):1143-52. [Medline]. Baker CL, Andrews JR, Ryan JB. Arthroscopic treatment of transchondral talar dome fractures. Arthroscopy. 1986. 2(2):82-7. [Medline]. Parisien JS. Arthroscopic treatment of osteochondral lesions of the talus. Am J Sports Med. 1986 May-Jun. 14(3):211-7. [Medline]. Pettine KA, Morrey BF. Osteochondral fractures of the talus. A long-term follow-up. J Bone Joint Surg Br. 1987 Jan. 69(1):89-92. [Medline]. Van Buecken K, Barrack RL, Alexander AH. Arthroscopic treatment of transchondral talar dome fractures. Am J Sports Med. 1989 May-Jun. 17(3):350-5; discussion 355-6. [Medline]. Pritsch M, Horoshovski H, Farine I. Arthroscopic treatment of osteochondral lesions of the talus. J Bone Joint Surg Am. 1986 Jul. 68(6):862-5. [Medline]. Alexander AH, Lichtman DM. Surgical treatment of transchondral talar-dome fractures (osteochondritis dissecans). Long-term follow-up. J Bone Joint Surg Am. 1980. 62(4):646-52. [Medline]. Canale ST, Belding RH. Osteochondral lesions of the talus. J Bone Joint Surg Am. 1980 Jan. 62(1):97-102. [Medline]. Flick AB, Gould N. Osteochondritis dissecans of the talus (transchondral fractures of the talus): review of the literature and new surgical approach for medial dome lesions. Foot Ankle. 1985 Jan-Feb. 5(4):165-85. [Medline]. Woods K, Harris I. Osteochondritis dissecans of the talus in identical twins. J Bone Joint Surg Br. 1995 Mar. 77(2):331. [Medline]. [Guideline] Thomas JL, Christensen JC, Kravitz SR, Mendicino RW, Schuberth JM, Vanore JV, et al. The diagnosis and treatment of heel pain: a clinical practice guideline-revision 2010. J Foot Ankle Surg. 2010 May-Jun. 49 (3 Suppl):S1-19. [Medline]. Tol JL, Struijs PA, Bossuyt PM, Verhagen RA, van Dijk CN. Treatment strategies in osteochondral defects of the talar dome: a systematic review. Foot Ankle Int. 2000 Feb. 21(2):119-26. [Medline]. Shearer C, Loomer R, Clement D. Nonoperatively managed stage 5 osteochondral talar lesions. Foot Ankle Int. 2002 Jul. 23(7):651-4. [Medline]. Donnenwerth MP, Roukis TS. Outcome of arthroscopic debridement and microfracture as the primary treatment for osteochondral lesions of the talar dome. Arthroscopy. 2012 Dec. 28(12):1902-7. [Medline]. Choi WJ, Choi GW, Kim JS, Lee JW. Prognostic significance of the containment and location of osteochondral lesions of the talus: independent adverse outcomes associated with uncontained lesions of the talar shoulder. Am J Sports Med. 2013 Jan. 41(1):126-33. [Medline]. Choi WJ, Park KK, Kim BS, Lee JW. Osteochondral lesion of the talus: is there a critical defect size for poor outcome?. Am J Sports Med. 2009 Oct. 37(10):1974-80. [Medline]. Al-Shaikh RA, Chou LB, Mann JA. Autologous osteochondral grafting for talar cartilage defects. Foot Ankle Int. 2002 May. 23(5):381-9. [Medline]. Hangody L, Kish G, Modis L. Mosaicplasty for the treatment of osteochondritis dissecans of the talus:two to seven year results in 36 patients. Foot Ankle Int. 2001 Jul. 22(7):552-8. [Medline]. Brittberg M, Lindahl A, Nilsson A. Treatment of deep cartilage defects in the knee with autologous chondrocyte transplantation. N Engl J Med. 1994. 331(14):889-95. [Medline]. Giannini S, Vannini F, Buda R. Osteoarticular grafts in the treatment of OCD of the talus: mosaicplasty versus autologous chondrocyte transplantation. Foot Ankle Clin. 2002 Sep. 7(3):621-33. [Medline]. Wiewiorski M, Miska M, Nicolas G, Valderrabano V. Revision of failed osteochondral autologous transplantation procedure for chronic talus osteochondral lesion with iliac crest graft and autologous matrix-induced chondrogenesis: a case report. Foot Ankle Spec. 2012 Apr. 5 (2):115-20. [Medline]. Niemeyer P, Salzmann G, Schmal H, Mayr H, Südkamp NP. Autologous chondrocyte implantation for the treatment of chondral and osteochondral defects of the talus: a meta-analysis of available evidence. Knee Surg Sports Traumatol Arthrosc. 2012 Sep. 20(9):1696-703. [Medline]. Murawski CD, Kennedy JG. Operative treatment of osteochondral lesions of the talus. J Bone Joint Surg Am. 2013 Jun 5. 95(11):1045-54. [Medline]. Stroud CC, Marks RM. Imaging of osteochondral lesions of the talus. Foot Ankle Clin. 2000 Mar. 5(1):119-33. [Medline]. Stone JW. Osteochondral Lesions of the Talar Dome. J Am Acad Orthop Surg. 1996 Mar. 4(2):63-73. [Medline]. Loredo R, Sanders TG. Imaging of osteochondral injuries. Clin Sports Med. 2001 Apr. 20(2):249-78. [Medline]. Elias I, Jung JW, Raikin SM, Schweitzer MW, Carrino JA, Morrison WB. Osteochondral lesions of the talus: change in MRI findings over time in talar lesions without operative intervention and implications for staging systems. Foot Ankle Int. 2006 Mar. 27(3):157-66. [Medline]. Cuttica DJ, Shockley JA, Hyer CF, Berlet GC. Correlation of MRI edema and clinical outcomes following microfracture of osteochondral lesions of the talus. Foot Ankle Spec. 2011 Oct. 4(5):274-9. [Medline]. Higashiyama I, Kumai T, Takakura Y. Follow-up study of MRI for osteochondral lesion of the talus. Foot Ankle Int. 2000 Feb. 21(2):127-33. [Medline]. Mesgarzadeh M, Sapega AA, Bonakdarpour A, Revesz G, Moyer RA, Maurer AH, et al. Osteochondritis dissecans: analysis of mechanical stability with radiography, scintigraphy, and MR imaging. Radiology. 1987 Dec. 165 (3):775-80. [Medline]. De Smet AA, Fisher DR, Burnstein MI. Value of MR imaging in staging osteochondral lesions of the talus (osteochondritis dissecans): results in 14 patients. AJR Am J Roentgenol. 1990 Mar. 154(3):555-8. [Medline]. Cheng MS, Ferkel RD, Applegate GR. Osteochondral lesion of the talus: A radiologic and surgical comparison. Paper presented at: Annual Meeting of Academy of Orthopaedic Surgeons, New Orleans, LA. February 1995. Lee KB, Bai LB, Park JG, Yoon TR. A comparison of arthroscopic and MRI findings in staging of osteochondral lesions of the talus. Knee Surg Sports Traumatol Arthrosc. 2008 Nov. 16 (11):1047-51. [Medline]. Ferkel RD. Articular surface defects, loose bodies, and osteophytes. Arthroscopic Surgery: The Foot and Ankle. Philadelphia, Pa: Lippincott-Raven; 1996. 145. Hepple S, Winson IG, Glew D. Osteochondral lesions of the talus: a revised classification. Foot Ankle Int. 1999 Dec. 20(12):789-93. [Medline]. van Bergen CJ, van Eekeren IC, Reilingh ML, Sierevelt IN, van Dijk CN. Treatment of osteochondral defects of the talus with a metal resurfacing inlay implant after failed previous surgery: a prospective study. 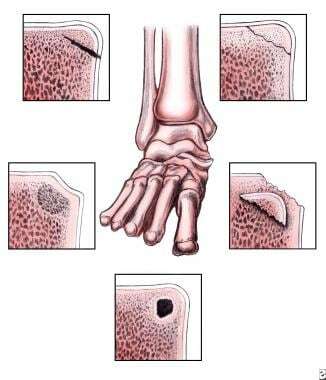 Bone Joint J. 2013 Dec. 95-B(12):1650-5. [Medline]. Kok AC, Dunnen Sd, Tuijthof GJ, van Dijk CN, Kerkhoffs GM. Is technique performance a prognostic factor in bone marrow stimulation of the talus?. J Foot Ankle Surg. 2012 Nov-Dec. 51(6):777-82. [Medline]. Kim YS, Park EH, Kim YC, Koh YG. Clinical outcomes of mesenchymal stem cell injection with arthroscopic treatment in older patients with osteochondral lesions of the talus. Am J Sports Med. 2013 May. 41(5):1090-9. [Medline]. Deol PP, Cuttica DJ, Smith WB, Berlet GC. Osteochondral lesions of the talus: size, age, and predictors of outcomes. Foot Ankle Clin. 2013 Mar. 18(1):13-34. [Medline]. Smyth NA, Murawski CD, Haleem AM, Hannon CP, Savage-Elliott I, Kennedy JG. Establishing proof of concept: Platelet-rich plasma and bone marrow aspirate concentrate may improve cartilage repair following surgical treatment for osteochondral lesions of the talus. World J Orthop. 2012 Jul 18. 3(7):101-8. [Medline]. [Full Text]. Chao J, Pao A. Restorative Tissue Transplantation Options for Osteochondral Lesions of the Talus: A Review. Orthop Clin North Am. 2017 Jul. 48 (3):371-383. [Medline]. Murawski CD, Hogan MV, Thordarson DB, Stone JW, Ferkel RD, Kennedy JG. Editorial. Foot Ankle Int. 2018 Jul. 39 (1_suppl):1S-2S. [Medline]. [Full Text]. Doral MN, Bilge O, Batmaz G, Donmez G, Turhan E, Demirel M, et al. Treatment of osteochondral lesions of the talus with microfracture technique and postoperative hyaluronan injection. Knee Surg Sports Traumatol Arthrosc. 2012 Jul. 20 (7):1398-403. [Medline]. Cohen B, Anderson R, Davis WH. Chevron-type transmalleolar osteotomy: an approach to medial talar dome lesions. Tech Foot Ankle Surg. 2002 Dec. 1 (2):158-62. Deland JT, Young K. Medial approaches to osteochondral lesions of the talus without medial malleolar osteotomy. San Diego: American Orthopaedic Foot and Ankle Society; 2001: 75. Ferkel RD, Zanotti RM, Komenda GA, Sgaglione NA, Cheng MS, Applegate GR, et al. Arthroscopic treatment of chronic osteochondral lesions of the talus: long-term results. Am J Sports Med. 2008 Sep. 36(9):1750-62. [Medline]. Giannini S, Buda R, Vannini F, Di Caprio F, Grigolo B. Arthroscopic autologous chondrocyte implantation in osteochondral lesions of the talus: surgical technique and results. Am J Sports Med. 2008 May. 36(5):873-80. [Medline]. Savva N, Jabur M, Davies M, Saxby T. Osteochondral lesions of the talus: results of repeat arthroscopic debridement. Foot Ankle Int. 2007 Jun. 28(6):669-73. [Medline]. Tasto JP. Arthroscopy of the subtalar joint and arthroscopic subtalar arthrodesis. Instr Course Lect. 2006. 55:555-64. [Medline]. Polat G, Erşen A, Erdil ME, Kızılkurt T, Kılıçoğlu Ö, Aşık M. Long-term results of microfracture in the treatment of talus osteochondral lesions. Knee Surg Sports Traumatol Arthrosc. 2016 Apr. 24 (4):1299-303. [Medline]. Bryant DD 3rd, Siegel MG. Osteochondritis dissecans of the talus: a new technique for arthroscopic drilling. Arthroscopy. 1993. 9(2):238-41. [Medline]. Kumai T, Takakura Y, Higashiyama I. Arthroscopic drilling for the treatment of osteochondral lesions of the talus. J Bone Joint Surg Am. 1999 Sep. 81(9):1229-35. [Medline]. Taranow WS, Bisignani GA, Towers JD. Retrograde drilling of osteochondral lesions of the medial talar dome. Foot Ankle Int. 1999 Aug. 20(8):474-80. [Medline]. Berlet GC, Mascia A, Miniaci A. Treatment of unstable osteochondritis dissecans lesions of the knee using autogenous osteochondral grafts (mosaicplasty). Arthroscopy. 1999 Apr. 15(3):312-6. [Medline]. Kumai T, Takakura Y, Kitada C, Tanaka Y, Hayashi K. Fixation of osteochondral lesions of the talus using cortical bone pegs. J Bone Joint Surg Br. 2002 Apr. 84(3):369-74. [Medline]. Gross AE, Agnidis Z, Hutchison CR. Osteochondral defects of the talus treated with fresh osteochondral allograft transplantation. Foot Ankle Int. 2001 May. 22(5):385-91. [Medline]. Kim CW, Jamali A, Tontz W. Treatment of post-traumatic ankle arthrosis with bipolar tibiotalar osteochondral shell allografts. Foot Ankle Int. 2002 Dec. 23(12):1091-102. [Medline]. Gobbi A, Francisco RA, Lubowitz JH, Allegra F, Canata G. Osteochondral lesions of the talus: randomized controlled trial comparing chondroplasty, microfracture, and osteochondral autograft transplantation. Arthroscopy. 2006 Oct. 22(10):1085-92. [Medline]. Haasper C, Zelle BA, Knobloch K, Jagodzinski M, Citak M, Lotz J, et al. No mid-term difference in mosaicplasty in previously treated versus previously untreated patients with osteochondral lesions of the talus. Arch Orthop Trauma Surg. 2008 May. 128(5):499-504. [Medline]. Matricali GA, Dereymaeker GP, Luyten FP. Donor site morbidity after articular cartilage repair procedures: a review. Acta Orthop Belg. 2010 Oct. 76 (5):669-74. [Medline]. Gautier E, Kolker D, Jakob RP. Treatment of cartilage defects of the talus by autologous osteochondralgrafts. J Bone Joint Surg Br. 2002 Mar. 84(2):237-44. [Medline]. Sammarco GJ, Makwana NK. Treatment of talar osteochondral lesions using local osteochondral graft. Foot Ankle Int. 2002 Aug. 23(8):693-8. [Medline]. Leumann A, Valderrabano V, Wiewiorski M, Barg A, Hintermann B, Pagenstert G. Bony periosteum-covered iliac crest plug transplantation for severe osteochondral lesions of the talus: a modified mosaicplasty procedure. Knee Surg Sports Traumatol Arthrosc. 2014 Jun. 22 (6):1304-10. [Medline]. Niemeyer P, Salzmann G, Schmal H, Mayr H, Südkamp NP. Autologous chondrocyte implantation for the treatment of chondral and osteochondral defects of the talus: a meta-analysis of available evidence. Knee Surg Sports Traumatol Arthrosc. 2012 Sep. 20 (9):1696-703. [Medline]. Koulalis D, Schultz W, Heyden M. Autologous chondrocyte transplantation for osteochondritis dissecans of the talus. Clin Orthop Relat Res. 2002 Feb. (395):186-92. [Medline]. Giannini S, Buda R, Grigolo B. Autologous chondrocyte transplantation in osteochondral lesions of the ankle joint. Foot Ankle Int. 2001 Jun. 22(6):513-7. [Medline]. Browne JE, Anderson AF, Arciero R, Mandelbaum B, Moseley JB Jr, Micheli LJ, et al. Clinical outcome of autologous chondrocyte implantation at 5 years in US subjects. Clin Orthop Relat Res. 2005 Jul. 237-45. [Medline]. McNickle AG, Provencher MT, Cole BJ. Overview of existing cartilage repair technology. Sports Med Arthrosc. 2008 Dec. 16(4):196-201. [Medline]. Coetzee JC, Giza E, Schon LC, Berlet GC, Neufeld S, Stone RM, et al. Treatment of osteochondral lesions of the talus with particulated juvenile cartilage. Foot Ankle Int. 2013 Sep. 34(9):1205-11. [Medline]. Kruse DL, Ng A, Paden M, Stone PA. Arthroscopic De Novo NT(®) juvenile allograft cartilage implantation in the talus: a case presentation. J Foot Ankle Surg. 2012 Mar-Apr. 51(2):218-21. [Medline]. Hatic SO 2nd, Berlet GC. Particulated juvenile articular cartilage graft (DeNovo NT Graft) for treatment of osteochondral lesions of the talus. Foot Ankle Spec. 2010 Dec. 3(6):361-4. [Medline]. Lee DH, Lee KB, Jung ST, Seon JK, Kim MS, Sung IH. Comparison of early versus delayed weightbearing outcomes after microfracture for small to midsized osteochondral lesions of the talus. Am J Sports Med. 2012 Sep. 40(9):2023-8. [Medline]. Kim YS, Park EH, Kim YC, Koh YG, Lee JW. Factors associated with the clinical outcomes of the osteochondral autograft transfer system in osteochondral lesions of the talus: second-look arthroscopic evaluation. Am J Sports Med. 2012 Dec. 40(12):2709-19. [Medline]. Santrock RD, Buchanan MM, Lee TH, Berlet GC. Osteochondral lesions of the talus. Foot Ankle Clin. 2003 Mar. 8(1):73-90, viii. [Medline]. Schuman L, Struijs PA, van Dijk CN. Arthroscopic treatment for osteochondral defects of the talus. Results at follow-up at 2 to 11 years. J Bone Joint Surg Br. 2002 Apr. 84(3):364-8. [Medline]. Woelfle JV, Reichel H, Nelitz M. Indications and limitations of osteochondral autologous transplantation in osteochondritis dissecans of the talus. Knee Surg Sports Traumatol Arthrosc. 2013 Aug. 21(8):1925-30. [Medline]. Berndt and Harty staging system for osteochondral lesions of the talus, with grades 1-4. Osteochondral lesions of the talus. Classification system based on CT.
Osteochondral lesions of the talus. Illustration of percutaneous transmalleolar drilling. Osteochondral lesions of the talus. Cannulated drill placed over a guidewire. Disclosure: Received consulting fee from Wright Medical Technology for consulting; Received royalty from Wright Medical Technology for consulting; Received consulting fee from Amniox for consulting; Received consulting fee from Stryker for none; Received consulting fee from Biomet for none. Disclosure: Serve(d) as a director, officer, partner, employee, advisor, consultant or trustee for: NovaStep, Inc.<br/>Received income in an amount equal to or greater than $250 from: NovaStep, Inc.
Disclosure: Serve(d) as a director, officer, partner, employee, advisor, consultant or trustee for: Wright Medical Technology; DJO Global; Stryker; Tissue Tech; ZimmerBiomet<br/>Serve(d) as a speaker or a member of a speakers bureau for: Wright Medical Technology; Artelon, <br/>Received research grant from: DJO Global; Tissue Tech;<br/> Received royalty from Wright Medical; ZimmerBiomet; Stryker; . Thomas H. Lee, MD (Assistant Professor of Orthopedic Surgery, Ohio State University College of Medicine; Consulting Surgeon, Orthopedic Foot and Ankle Center) is gratefully acknowledged for contributions made to this article.